By piato. Finished. Used the walkthrough once. Played on iPhone. Duel is sort of a mash-up of Invisible Parties and the endgame combat of Acheton. You participate in a duel of mental summoning and have a limited list of moves like “a memory of madness” or “a memory of mastery, painfully won” that each can be only used once. Thus this is a game of timing responses to your opponents attacks. The nature of the overarching puzzle requires repeated plays. Hence: a lot of repetition of text and clicking. The “madness” summon is particularly noteworthy with an epic three-page story given before confirming. There likely is a more elegant way to handle this (possibly code acknowledging when text has been seen before and compressing it second time around) but since links are placed consistently at the end of the text it’s easy to breeze through. The puzzle otherwise was quite enjoyable to work through and there was a lovely twist based on the summon being out of the protagonist’s memory. I would like to discuss one particular part in depth, but it is a heavy spoiler, and I don’t recommend reading until after you’ve tried the game yourself. I was stuck on summoning the golem because the enemy destroys it almost immediately upon summoning (this is where I needed the walkthrough). What I needed was to ignore a directive given by the text, that custom dictates that you make the first move. I somehow had got the impression it was a requirement, but the only way to win is to ignore this and start the game by waiting. You are told “How unorthodox” but still can continue with the action (or inaction, rather). 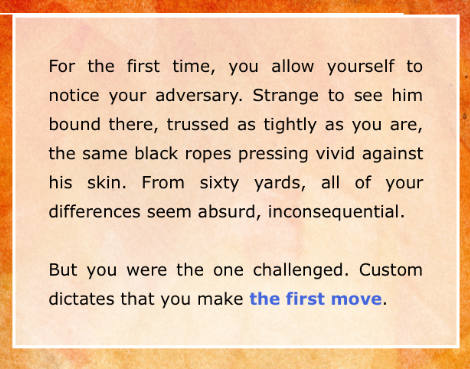 One of favorite puzzle-types are ones which undermine unconscious assumptions; this was a perfect example. Hah, whereas my very first playthrough was basically clicking “do nothing” every single time to see what would happen. I mean, I wouldn’t do that in a traditional parser game, but I guess when it comes to “choice-based” stuff I tend to expect each of the choices to matter… which is often not borne out, to be sure, but. Can you elaborate on “a lovely twist based on the summon being out of the protagonist’s memory”? Is this why the game restarts if you end with Avashi turning against you? I don’t quite understand what’s going on there. Avashi does not have kind thoughts towards you. I gathered you were summoning a past enemy, not ally. If given the chance she will go loose cannon and kill you. Ah hm, I actually thought that your opponent is the one who turns Avashi against you. Looking forward to an author post-mortem.